This was a very full weekend. I've been having fun with my family in town. 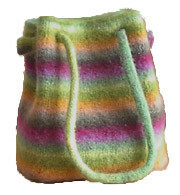 I'm going to make my mom a felted bag as well but I think I'm going to use this pattern for hers since she needs something a little bigger (I'll probably alter the pattern just a bit). We had fun going to a yarn store together. She got a beautiful red/salmon color of Cascade 220. I think it's going to look beautiful! This weekend I also went to the Third Eye Blind concert on Saturday. It was a blast. They are one of my favorite bands and I've seen them 3 times now! We also started planning a trip to the Shakespearean Festival in Cedar City Utah, which is an amazing experience. I went for the first time last summer with my grandmother and we had such a fun time. I'm excited for this summer for a couple of reasons, first because they are doing my three all time favorite plays and second because my mother and I are going to go together! The plays we are going to see are "A Mid Summer Night's Dream", "Romeo & Juliet", "Love's Labours Lost" and Camelot. They usually do two non-Shakespeare plays each summer and I'm excited to see Camelot since I've never seen a production of this before. I seriously can't wait! We are going to have sooo much fun!